If you are a regular reader of PopCult, you may have noticed that this blog was offline for a few days last week. The Tech Gurus here at the Gazette-Mail were making some much-needed upgrades, and as a result, the blogs were out of commission for a day or three. Since I did not know this, and had prepared several day’s worth of PopCult in advance before I left town for a grand adventure, I decided to re-present part of what I’d planned for last week. 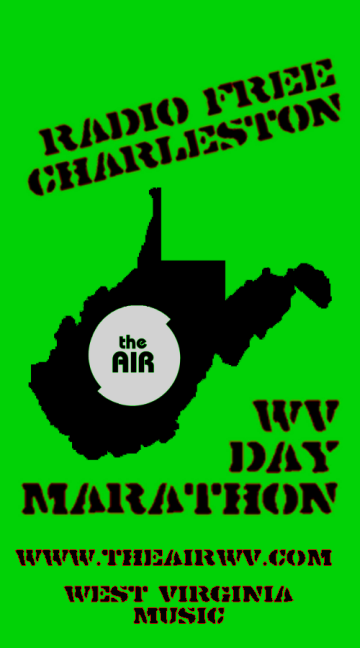 Last Wednesday was West Virginia Day, and I scheduled a marathon of Radio Free Charleston, presenting great West Virginia music on our sister radio station, The AIR. Since I am still recovering from my grand adventure and could use some extra time before I begin telling you all about it, here is a revised West Virginia Day Marathon, scheduled for Tuesday, June 26. Enjoy. Radio Free Charleston is, of course, West Virginia’s longest-running program devoted to WV-based music of all types. Currently the exclusive home of RFC is The AIR, and to mark West Virginia Day we’ve programmed thirty straight hours of local music. This is not just stereotypical hillbilly hoedown music. You will hear Rock, Metal, Progressive Jazz, Pop, Fusion, Prog Rock, Retro-rock, Rap, New Age, Soul, Cabaret, Art Rock and just about any genre of music you can imagine. The closest we get to Country music is some of the Americana, but the point of Radio Free Charleston has always been to showcase the divisity and myraid talents that our state harbors. Among the music you’ll hear during the marathon are classic tracks from recent years, brand-new music, and hidden gems from deep in the 30-plus year RFC Archives. Tune in and find out that there’s so much more to our state’s music scene than song-storyin’ about the hill and ballads about coal mine disasters. It’ll give you hope for our future. This RFC marathon starts at 9 AM Tuesday morning and runs until 1 AM Wednesday morning. You can hear a weekly mini-marathon of Radio Free Charleston every Saturday at Midnight, exclusively on The AIR.